Being the public voice of over 180 member organisations across nearly 90 countries, La Vía Campesina, the global peasant movement, has planted itself firmly on the international scene. This book explores the internationalisation of the movement, with a specific focus on the engagement of peasants in the processes of the Committee on World Food Security (CFS). Since the reform of the CFS in 2009, civil society actors engage in the policy processes of this UN Committee from a self-designed and autonomous global Civil Society Mechanism. The author sheds light on the strategies, tensions, debates, and reconfigurations arising from rural actors moving between every day struggles in the fields and those of the UN arena. Whereas most theories in the dominant literature on social movements expect them to either disappear or institutionalise in a predetermined pattern, the book presents empirical evidence that La Vía Campesina is building a much more sophisticated model. The direct participation of representatives of peasant organisations in the CFS is highlighted as a pioneering example of building a more complex, inclusive and democratic foundation for global policy-making. Foreword by Olivier De Schutter, United Nations Special Rapporteur on the Right to Food (2008-2014). "Ingeborg Gaarde offers us an intriguing multi-sited ethnography of the UN Committee on World Food Security (CFS) via the lens of the international peasant and landless coalition, La Vía Campesina (LVC), and its reflexive engagement within a key UN forum. Juxtaposing insights from interviews, strategic positioning, tensions and dilemmas, the author reveals agrarian movement agency in the process of negotiating with an international institution. This book provides an important perspective on social movement advocacy for alternative agrarian futures." – Philip McMichael, Cornell University, USA and author of Food Regimes and Agrarian Questions (2013). 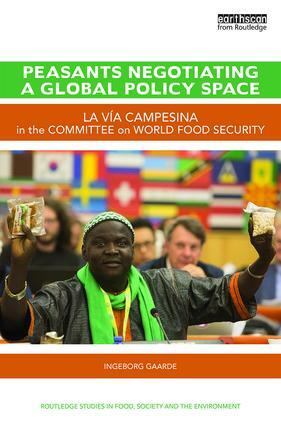 "In this book Ingeborg Gaarde presents a subtle analysis of the actions and institutional dynamics, when the global peasant movement, La Via Campesina – the world largest social movement – today engages within the reformed Committee on World Food Security. With empirical data collected in both local and global contexts – from settlements and camps in Brazil to the halls of the United Nations – Gaarde presents an impressive set of first-hand qualitative data to analyse the opportunities and challenges arising from movement’s engagement in UN multi-stakeholder negotiations. This book is a much-needed analytical perspective that goes beyond classic dichotomies (contentious movements vs. institutionalized actors; inwards dynamics vs. outwards strategies; outsiders vs. insiders…) and explores how actors seek to overcome these dilemmas by fostering complementarities between different forms of political activism." – Geoffrey Pleyers, Université Catholique de Louvain, Belgium and author of Alter-Globalization. Becoming Actor in the Global Age (2010). "Sociological analysis must be global and consider multiple levels. These levels are interwoven, from the most general to the most personal, most intimate, most individual, via the national and the local. With this book, Ingeborg Gaarde not only manages to move intelligently between these levels, she also makes us understand something very new: that the most innovative contemporary social movements may be those that classic thinkers judge archaic because they are distant, dealing with the earth, far from the centers – and apparently from modernity. La Vía Campesina peasants show how rural actors could not be more modern, more both local and global. They talk like the postmodern actors in the name of dignity and democracy and their space is planetary. A beautiful lesson of sociology." – Michel Wievioka, Ecole des Hautes Etudes en Sciences Sociales (EHESS), Paris, France and President of the Fondation Maison des Sciences de l'Homme. Ingeborg Gaarde holds a PhD in Sociology from the Ecole des Hautes Etudes en Sciences Sociales (EHESS), Paris, France. She has ten years of experience working with social movements on five continents. She has divided her time between research and consulting for international NGOs and the UN, mainly on issues related to natural resources conflicts, tenure governance and involvement of civil society actors and participation in global policy-making processes.